A year after the UK doubled its drone fleet David Cameron visited RAF Waddington today to signal further commitment to – and spending on – drones and special forces. The Prime Minster told the media that he had asked Defence Chiefs to look at how to do more to counter the threat posed by ISIS including spending more on “spy planes, drones and Special Forces.” Cameron insisted that “in the last 5 years, I have seen just how vital these assets are in keeping us safe.” He also, according to reports, suggested that the new Aircraft Carrier, Queen Elizabeth could be used to deploy drones in the future. It is already well known that funding future drone programmes will be a significant part of the Strategic Defence and Security Review (SDSR) due to report in the Autumn, so today’s announcement appears to be aimed, at least in part, at further laying the ground work for UK drone and air strikes in Syria. 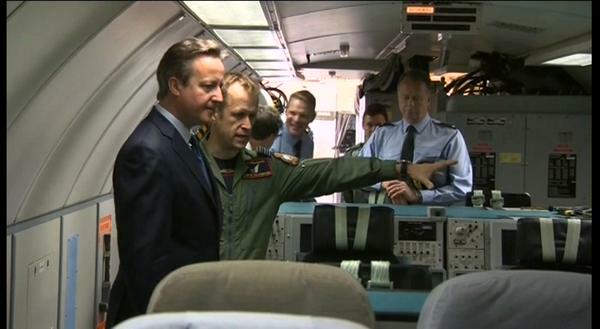 The idea, as Cameron and Fallon both claim that more drones and drone operations ‘keep us safe’ is nonsense. For more than a decade the UK has taken part in a series of ruinous military interventions. The invasion of Iraq, based on false intelligence destroyed the country and laid the foundation for the rise of ISIS. The air war against Gaddafi in 2011 was also disastrous resulting in two separate Libyan governments and armed factions fighting each other, giving space, we are being told, for terrorist bases. And after more than a decade of intervention in Afghanistan with thousands killed, including more than 450 British soldiers, the Taliban are able to carry our deadly attacks even in the supposedly safest places. Military intervention does not make the world a safer place – far from it. And today’s announcement sets the scene for further such intervention, drawing us into seemingly permanent war. Prime Minister David Cameron and Defence Secretary Michael Fallon are beating the drum for further UK military intervention by undertaking air strikes in Syria. However increasing the amount of drone and air strike in Iraq and Syria is bound to increase civilian casualties. Observers report that already between 500 and 1,000 civilians have already died in coalition bombing in Iraq and Syria and if the number of strikes increase, this will only rise. No doubt too, the ‘blowback’ of terrorist attacks on Western civilians will also increase. But beside the specifics of this intervention there is the wider problem that drones are being presented and packaged, by the drone lobby, the military and senior political figures as incredibly precise, as risk-free, as the perfect solution for a war weary nation on a budget. That narrative is hugely unrealistic and sets us up for the very real problem that each time there is a international political crisis – whether it be an influx of refugees into southern Europe, whether it be tribal conflict descending into ethic killings in East Africa or whether it be threats to allies in the Middle East or South East Asia – politicians and the press are going to be demanding that we send in the drones to sort the problem as there is no perceived cost in doing so. Drones mean that military intervention is fast becoming not the last option, but the norm.